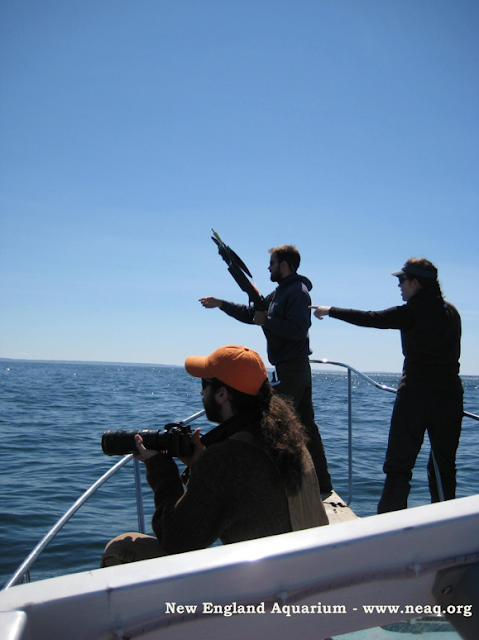 This year marks the twentieth anniversary of an exciting and valuable collaboration between right whale researchers at the New England Aquarium and geneticists at Trent University (Peterborough, Ontario). Although much of what has been learned about the life history of right whales is through photo identification studies, comprehensive genetic analyses and integration of the two research techniques have yielded information on right whale biology and conservation that serves as a model for studying small but persistent populations. All that is needed is a small piece of skin, about the size of a pencil eraser, collected from a right whale at sea, to get access to DNA and a means to examine maternity, paternity, identify individuals and genealogical relationships, genetic diversity, effective population size, and reproductive success. The small bits of skin are collected by biopsy sampling - the collection of living tissue from a live specimen; in our case it is skin and sometime a bit of blubber as well. 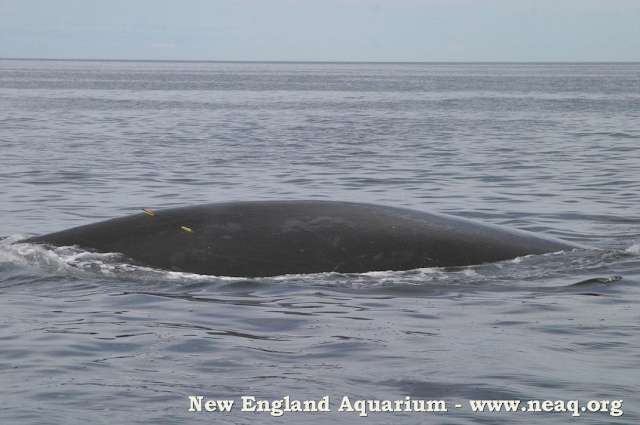 There is a strict protocol to follow to biopsy dart a right whale. 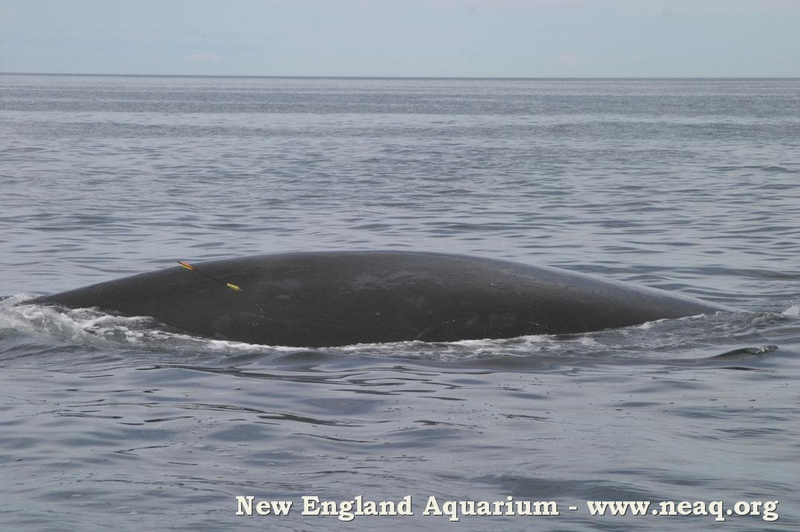 Since we conduct research in both the USA and Canada, the National Marine Fisheries Service and the Canadian Department of Fisheries and Ocean must issue a specialized permit to a researcher who has shown to have the qualifications and training necessary to safely sample a right whale. Researchers use a crossbow equipped with a modified arrow designed to bounce off the whale on impact, taking with it a one inch sample of skin and blubber. The tip of the arrow has a hollow cylinder with three backward facing prongs inside it, backed by foam core to prevent deep penetration. The edge of the tip pierces the skin of the whale while the prongs grip the skin and blubber removing it as the foam backing rebounds off the whale. The process is minimally invasive and when done correctly elicits little or no reaction from the whale. In addition to the DNA studies, the skin is also analyzed by epidemiologists to investigate disease and by a toxicologist trying to understand the effect the urban environment has on the population. There is a collaborative effort of researchers from the United States and Canada to obtain a biopsy sample of every right whale in the population. Researchers from National Marine Fisheries Services and Georgia Department of Natural Resources work together to collect biopsy samples from calves born in the Southeast United States (Revisit our Aerial Survey Blog from 2008 for more on this aspect of right whale research.). Because the unique callosities patterns do not develop on calves for several months, the only way to distinguish one from another early on is by the association with the mother. Some of the calves in the southeast will not be seen anywhere in the northeast and a genetic identification from the calving ground will be the only link we have to its lineage. During the first 6 months of a calf's life it does not stray far from the mother. Then, in summer and fall, the pair slowly begins to spend more time apart until the calf is fully weaned at the end of its first year. By collecting biopsy samples during the first 12 months researchers can track the mother and calf lineage. New England Aquarium researchers biopsy dart whales in the Bay of Fundy during our summer field season. We biopsy dart mothers and calves missed in the Southeast United States, whales from previous years that have never been sampled and any visibly injured or special interest right whales. The samples are sent to the corresponding laboratories in the USA or Canada where they are analyzed to learn more about this critically endangered species to help researchers enhance conservation measures. I'll make sure to pass this on to the other researchers, thanks Joseph!